Significant damage occurred to the Brandon, Vermont downtown area when Tropical Storm Irene caused flooding and overtopping of US Route 7. The floodwaters damaged the town offices, Gazebo Park, portions of Briggs Lane and US Route 7, as well as private and commercial properties. DuBois & King engineers provided design of an overflow culvert to prevent future potential of the Neshobe River overtopping in the congested channel. The overflow culvert will reduce impacts from future high water events by redirecting up to the 500 year storm event away from the choke point that goes under Route 7, businesses, and the town offices. The Town of Brandon received a Hazard Mitigation grant of $2.55M from FEMA to fund the construction of the culvert crossing under US Route 7. 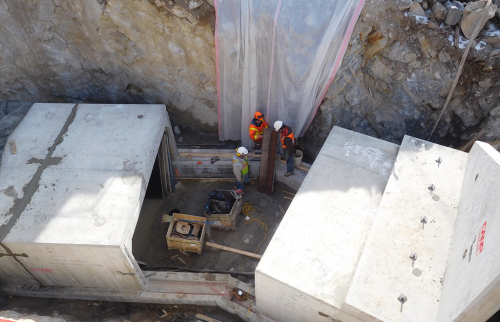 Detailed hydraulic and hydrologic analysis was performed to guide the development of the overflow structure. Designed to accept overflow from the Neshobe River, the new 278-ft, 6-ft-high, by 12-ft-wide three-sided concrete precast structure has a sloped tapered inlet, horizontal and vertical bends, and an integral retaining wall energy dissipater outlet baffle. Extensive, detailed design was required to fit the buried structure into the constrained site—with adjacent unstable buildings, existing utilities, and shallow ledge—to prevent impacts to abutting structures and property. In addition to design services, D&K is providing full-time resident engineering services for the overflow culvert construction, which is scheduled for completion early this spring. 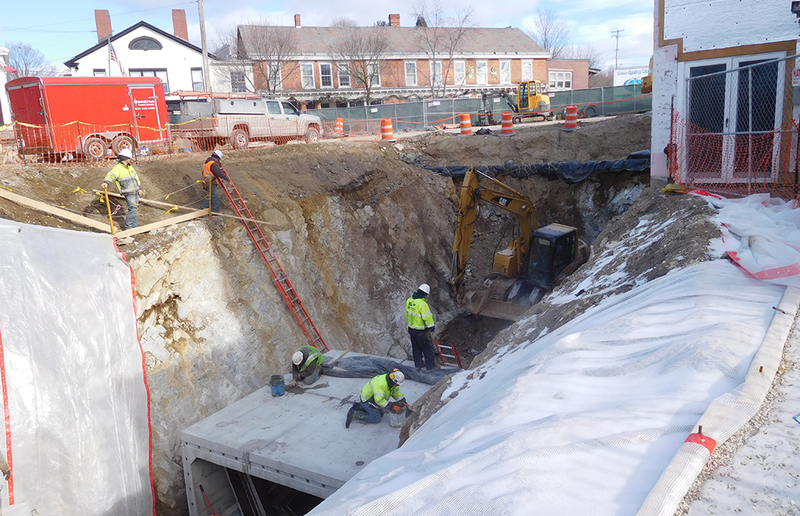 The timing for completion of the overflow culvert is crucial, as planned reconstruction of US Route 7 through the downtown is scheduled to start in May.